I have been seeing egg dishes with something called soldiers for awhile now. I did some research and the soldiers are just strips of toast. 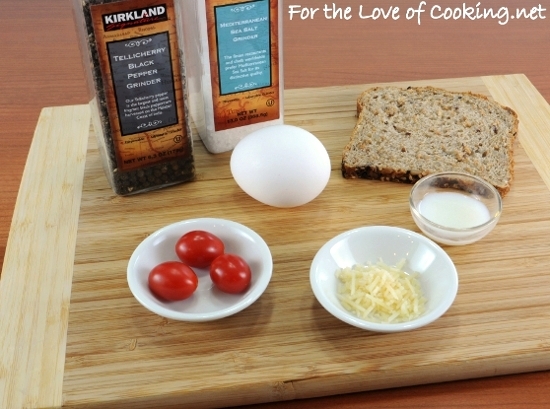 The toast is cut into strips to make dipping into the egg easier. I was craving something quick and simple for lunch today so I checked the refrigerator to see what I had on hand. I decided to bake an egg. I added Parmesan cheese and a bit of sliced grape tomatoes to the egg and I served it with toast “soldiers”. It was a simple and delicious dish. 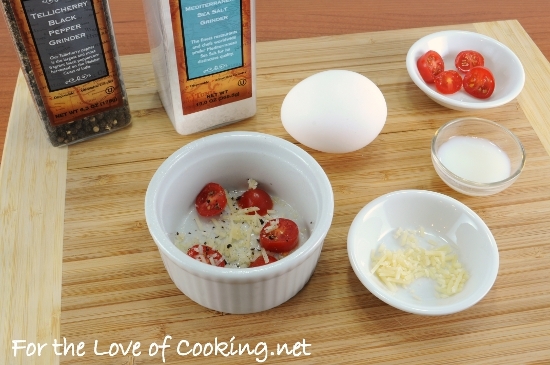 I loved the salty Parmesan with the sweet tomatoes and the toast dipped in the egg tasted wonderful. Preheat the oven to 350 degrees. Coat a small ramekin with cooking spray. Place a couple of tomatoes and some Parmesan into the ramekin. 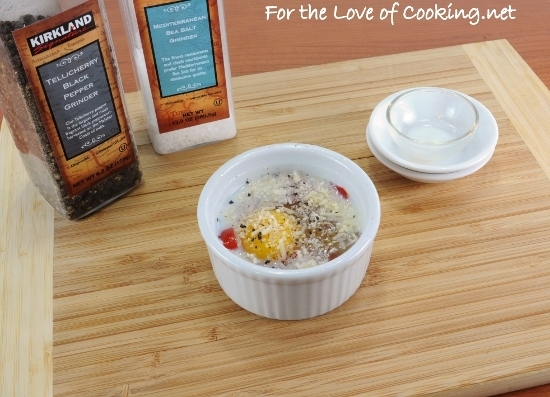 Crack an egg into the ramekin, being careful not to break the yolk. Add the milk, a few more tomatoes and Parmesan to the top. Season with sea salt and freshly cracked pepper, to taste. Place onto a baking tray and cook for 5 minutes; Turn the oven to broil and cook for another 5 minutes or until the whites are set but the yolk remains soft. Meanwhile, place a piece of bread into the toaster and toast. Butter the toast then cut into 4 equal strips. Remove the egg from the oven and serve with the soldiers immediately. Enjoy. Preheat the oven to 350 degrees. Coat a small ramekin with cooking spray. Place a couple of tomatoes and some Parmesan into the ramekin. Crack an egg into the ramekin, being careful not to break the yolk. Add the milk, a few more tomatoes and Parmesan to the top. Season with sea salt and freshly cracked pepper, to taste. I have a fairly new oven, and when i hit broil it gives me the option of high or low. when a recipe calls for broil, which should i select? Recipe looks amazing by the way, will be making it for breakie! This would be a great breakfast! YUM! I love dipping toast into perfectly runny eggs. My boys would love calling their toast “soldiers.” I need to remember to cut it into strips and tell them about that next time. Thanks! Yummy !!!!! Great breakfast !! I love baked eggs! What a simple yet perfect lunch! 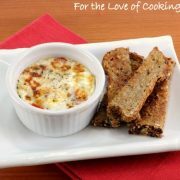 I have never tried baked eggs!Your recipe makes me wanna try them!Have a lovely weekend,dear! Looks great! 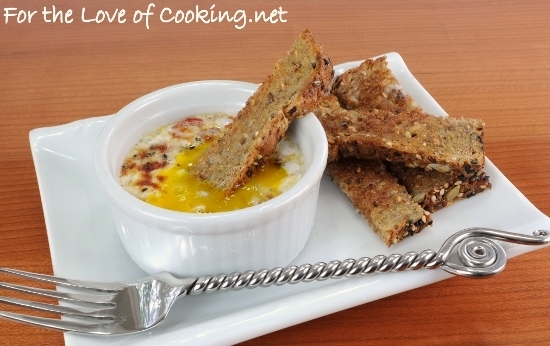 I’ve never made eggs with soldiers, have to try, I love dipping toast into the baked eggs. Wow, this brings back memories! My dear Welsh mother-in-law, who passed away just before Thanksgiving, loved anything with eggs and toast. Her favorite combo was a soft boiled egg served with “soldiers” or “finger butters”. 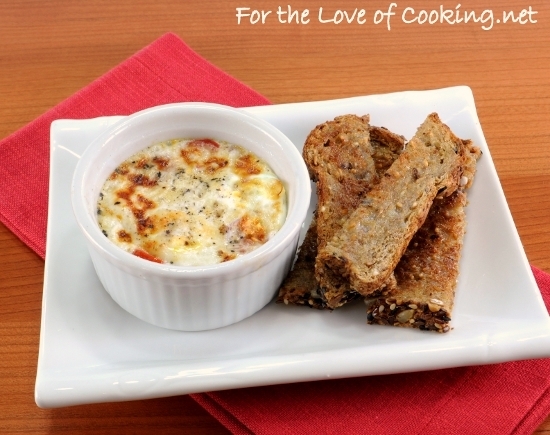 Just like Diane wrote – dip the soldiers into the runny yolk. I think of her every time I prepare them for my son. I absolutely LOVE this idea!! This looks unbelieveably delicious.. yum! would love to try it. I made baked eggs with bacon and cheese this morning. know this kind of recipe from you! thanks! it’s one of my favourite breakfast menu nowadays!!! looks yummy. as kids we would often have ‘dippy’ eggs for breakfast with toast. simple and satisfying. What a wonderfully wholesome and delicious breakfast idea, Pam! This looks so simple and really tasty for a morning treat. Thanks for sharing! Have a great weekend. You can’t go wrong with these classic flavors! Or with those soldiers! This sounds exactly like something your son would like, even as he plays army with his food. I could hear the ruckus around my table with toast soldiers, even though my boys are all older! toast soldiers–i always snicker at that name. tasty meal, pam! You go girl – I’d sure eat this. Looks amazing… and so sophisticated for just a “quick lunch”. Hi Pam, just wanted to let you know that when I click your link in my favorites I get an old post and if I hit refresh I do get your latest post, so I resaved the link in my favorites and I get that post day after day but when I hit refresh I do get your latest post. I’m not sure why it wont open your latest post but I’m going to try some other things to see if I can’t get it to open your latest posts without having to hit refresh. By the way I do like your new site, I’m sure all the bugs will get worked out. This looks delicious. I love the flavor of tomatoes with eggs and cheese. The toast soldier are a great idea for dipping. i LOVE breakfasts like this. and what a great idea to slice up your toast. so simple, yet i would probably never think to do it. I thing this could be the healthiest breakfast and recipe. Thanks for sharing surely will go thought the recipe. I’ll see your “toast soldiers” and raise you “slaw sailors”, “corn pilots”, and not to mention, “Admiral BBQ”, haha. This looks tasty, Pam, especially now that you have me hooked on baked eggs. Eggs are so under appreciated – your recipe shows just how delicious they can be! It is almost time for breakfast!! I’m ‘ Anne from Belgium and I wanted to let you know that we also have these ‘soldiers’ here! We cut our fresh or toasted bread this way to make dipping in a boiled egg easier. Children love this, and so we sometimes cut there bread in ‘soldiers’ even when not accompanied by an egg, just to make them eat better. It helps ! Oh these look so yummy,Great recipe here !! “Soldiers” is so much cuter than “strips of toast”. This is comfort food at its best! Oh my gosh. I love toast soldiers!!! My dad used to make them with lipton noodle soup when I was sick when I was younger. Now we make real noodle soup from scratch, but I’m so glad to see another recipe with them!! Brings back so many memories. I love the french toast soldiers! Will have to make this for a quick, healthy, hearty breakfast.